Green-Rainbow activists worked with many others across the state to put war and peace spending on the ballot. Rick Purcell worked heroically in Holyoke, getting signatures for this referendum and also registering new voters who wanted to sign but had not yet registered to vote. Scott Laugenour also worked hard in the Berkshires 4th District. And Isabel Espinal worked to get signatures in Amherst. Says Cole Harrison, of Massachusetts Peace Action: "Peace groups and the Green-Rainbow Party led the organizing in the Western Massachusetts towns of Amherst, Northampton, and in the Berkshires. In the blue-collar, economically depressed cities of Lawrence, Fall River, Holyoke, and Chelsea, with large Latino populations, ad hoc groups of activists made the difference, led by a school committeewoman in Lawrence, an Occupy group in Fall River, a Green-Rainbow activist in Holyoke, and a peace group in Chelsea. In these areas there is a hunger for participation and a search for effective means of political action." Read Cole Harrison's account of how people came together all over the state so we the people can vote for peace. District by district, town-by-town, activists gathered almost 20,000 signatures in May and June and successfully qualified for the ballot in 7 State Senate districts and 24 State Representative districts (an eighth Senate district remains to be tabulated). As a result, approximately a million Massachusetts voters – about 1/3 of the state’s expected 3 million voters in a presidential election year – will have the opportunity to endorse the anti-austerity public policy question on November 6. Low income community based groups did most of the work in Boston and some smaller cities, while local peace groups showed that they have a base in suburban towns across the state. Led by grassroots community groups, the referendum qualified in the entire city of Boston. The Massachusetts Alliance of HUD Tenants led the way in two Boston Senate districts, knocking on doors in housing projects and standing in front of supermarkets. The Right to the City Civic Action Alliance, which includes the Chinatown Progressive Association, Neighbors United for a Better East Boston, New England United for Justice, Boston Workers Alliance, and Project Hip-Hop, canvassed in low-income people of color neighborhoods. Dorchester People for Peace and the Boston 25% Coalition powered the Dorchester Senate district. In all these areas the great majority strongly supports our agenda – the need for jobs programs, care about services such as Social Security, Medicare, Medicaid, and housing, and support cutting the military. Canvassers registered many new voters and emphasized the importance of political participation. Peace groups, sometimes supported by suburban Occupy groups, successfully tackled Boston’s near suburbs as well as towns west of Boston and on the North Shore, talking to voters at libraries, farmers’ markets, supermarkets, and town fairs. Peace groups and the Green-Rainbow Party led the organizing in the Western Massachusetts towns of Amherst, Northampton, and in the Berkshires. In these relatively liberal, majority white areas, most people who hear the pitch are willing to sign, some saying, “Who wouldn’t sign this?” Among those who don’t, the most common objection is to raising taxes on incomes above $250,000 – especially from those who earn more or who think they may in the future. Also, some voiced a generalized distrust of government therefore too cynical to sign any petition or engage in any political process. In the blue-collar, economically depressed cities of Lawrence, Fall River, Holyoke, and Chelsea, with large Latino populations, ad hoc groups of activists made the difference, led by a school committeewoman in Lawrence, an Occupy group in Fall River, a Green-Rainbow activist in Holyoke, and a peace group in Chelsea. In these areas there is a hunger for participation and a search for effective means of political action. The Budget for All (B4A) faced its most challenging territory in towns in the southwest, southeast and northern suburbs of Boston. In these areas, there has been less peace and progressive activism and more right-wing influence and anti-tax ideas. The B4A petitioning was done by clusters of individual activists, and in the case of Melrose by an AFGE local. Here, a call to cut the military budget raises eyebrows– the Budget for All’s call to end the Afghanistan war and cut the military budget generated significant opposition, and many complained that the referendum addresses too many issues, with people supporting some issues but not others. In these districts, public education will be critical to convince undecided voters to back the referendum now that it is on the ballot. The B4A did not qualify for the ballot everywhere we tried. Some areas volunteers gathered signatures but fell short. But volunteers with a statewide perspective did cross-district lines and helped make the difference in other areas. Now, the coalition is regrouping to focus on passing the B4A referendum this fall. 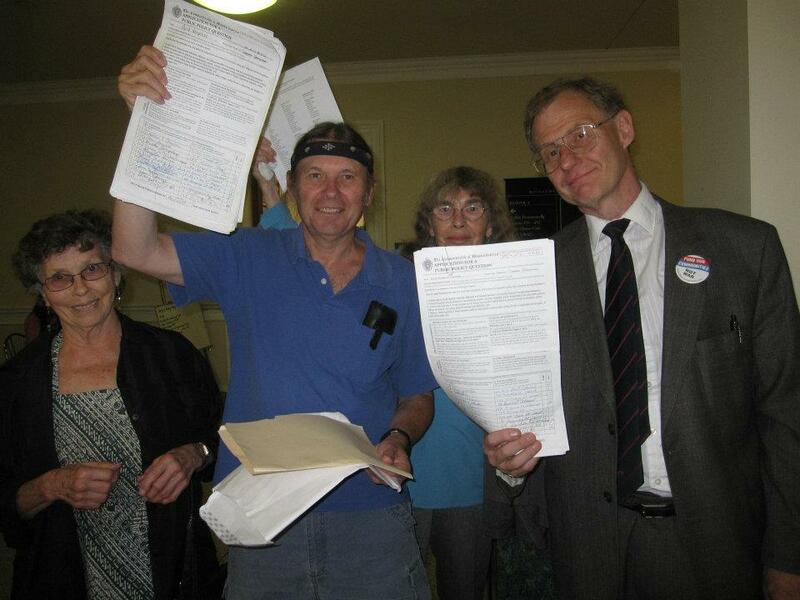 On July 25 20 volunteers lobbied legislators at the State House introducing the referendum to the legislators who will, if it passes, be instructed by the voters to call on Congress and the President to implement the B4A agenda. In August regional and district organizing planning meetings will be held for the fall campaign. We’ll leaflet voters at the polls on Primary Election day, September 6. We’ll get the word out through op-eds, letters to the editor, social media, and yard signs. We will also hold campaign events in each region of the state, and hopefully in most districts where the referendum is on the ballot, featuring elected officials who support the measure as well as organizers and entertainers, to build support and energy. The scores of volunteers are proud of the successful drive to get the B4A referendum on the ballot, and they want to keep it going. A ballot referendum is one tool to help build the grassroots movement necessary to win a change in national spending priorities, from wars and new weapons to fund our communities. Massachusetts Peace Action looks forward to a successful fall campaign as we stand shoulder to shoulder with our friends and allies. For more info on how you can get involved: Call 617-354-2169. Cole Harrison is Communications Director of Massachusetts Peace Action. He was born in Delhi, India, has a B.A. from Harvard in applied mathematics, a M.S. from Northeastern in computer science, and lives in Roslindale, Massachusetts. Results are in for Holyoke, 72.55% voted in Favor of a Budget for All Referendum question. 14 of 14 precincts reporting at least 60% in Favor, elected officials this is your chance to do the will of the People.